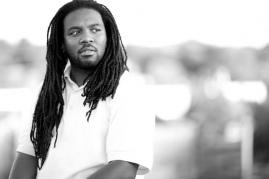 Derrick Weston Brown holds an MFA in creative writing, from American University. He has studied poetry under Dr. Tony Medina at Howard University and Cornelius Eady at American University. He is a graduate of the Cave Canem Summer workshop for black poets the VONA summer workshop, and Squaw Valley Summer workshop. His work has appeared in such literary journals as The Little Patuxent Review, Mythium, The Tidal Basin Review, DrumVoices, The Columbia Poetry Review, and the online journals Beltway Poetry Quarterly, Howard University’s Amistad, LocusPoint, MiPOesias,Vinyl Poetry and Borderline. He’s also performed at many poetry venues around the country; from The Bowery in NYC to Beyond Baroque in Los Angeles. He works as a bookseller and book buyer for a wonderful bookstore which is operated by the nonprofit organization Teaching for Change, and is located within the restaurant, bar, coffee shop and performance space known as Busboys and Poets. As the former inaugural Poet-In-Residence of Busboys and Poets, he is the founder and curator of The Nine on the Ninth, a seven-year-old monthly poetry series, and helped coordinate the poetry programming at the 14th & V street location. He teaches Poetry and Creative writing to an amazing crew of seventh and eighth graders at Hart Middle school in Southeast Washington, DC and a small but gifted class of high schoolers at Emerson Preparatory School. He is currently the 2012-2013 Writer-In-Residence of the Howard County Poetry Literary Society, of Howard County Maryland and he is also a visiting artist for the PEN/Faulkner Foundations’s Writers In Schools program for 2012-2013. He is a native of Charlotte, North Carolina, and resides in Mount Rainier, Maryland. His debut collection of poetry entitled, Wisdom Teeth, was released in April 2011 on Busboys and Poets Press/PM Press. Amistad, Beltway Poetry Quarterly, Borderlines, Columbia Review, Drumvoices Revue, Drunken Boat, Ginosko Literary Journal, Little Patuxent Review, MiPOesias, Mythium, Reverie: Midwest African American Literature, Tidal Basin Review, Vinyl, WarpLand, Words. Beats. Life.